While jazz musicians often interpret one another’s music, it’s unusual to find an album receiving that kind of attention (Miles Davis, as is so often the case, is the exception, with his seminal records “Birth of the Cool” and “Kind of Blue” often reinterpreted in toto). 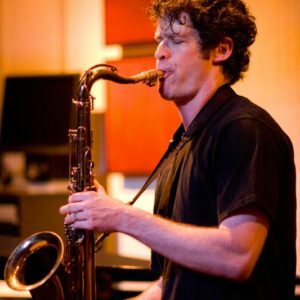 With the Ugetsu Project, which plays San Jose Jazz’s free Music at the Market series Friday and Oakland’s Sound Room on Saturday, tenor saxophonist Anton Schwartz turns his attention to a classic live album recorded by Art Blakey and the Jazz Messengers exactly 50 years ago this weekend. What’s unusual about the undertaking is that “Ugetsu,” which was recorded at the storied New York jazz club Birdland and released on Riverside, might not crack a list of the top five greatest recordings by the legendary drummer (whose band was modern jazz’s greatest proving ground for rising talent). That’s not to say “Ugetsu” was a middling effort. By any measure, the album captured Blakey’s prodigiously potent sextet at the top of its game, having recently returned from a tour of Japan (the album’s name means “fantasy” in Japanese). Featuring tenor saxophonist Wayne Shorter, trumpeter Freddie Hubbard, pianist Cedar Walton, trombonist Curtis Fuller and bassist Reggie Workman, the band was stocked with prolific composers, who supplied Blakey with a steady flow of crisp, meaty hard-bop anthems. Although he relocated to Seattle about three years ago, Schwartz is still a regular presence on the Bay Area scene. He tours and records with the great Ed Reed, the East Bay jazz singer who is enjoying his first brush with jazz notoriety in his 80s. Schwartz continues to teach at the Jazzschool, presents loft concerts at his pad in Oakland, and is always looking for opportunities to play. The challenge behind the Ugetsu Project was twofold: first, finding a cast of players up for the unenviable but exhilarating challenge of stepping into roles defined by some of jazz’s most influential and formidable improvisers, and second, transcribing the tunes like Shorter’s “Ping-Pong” and “On the Ginza” and Walton’s title track. For the band, Schwartz lined up a crew of highly versatile and sought-after players, including trombonist John Gove, pianist Adam Shulman, bassist Mike Bordelon, drummer Greg Wyser-Pratte, and trumpeter Mike Olmos (who paid tribute to Freddie Hubbard last summer at an SFJAZZ Hotplate concert). And he enlisted Shulman to assist with transcription. “I love all the iterations of the Messengers, but this version with Cedar Walton is a favorite of mine,” Shulman says, noting that the pianist has written more than half a dozen bona fide jazz standards. The pianist has been working with Schwartz for more than a decade, since his days at UC Santa Cruz, when he was drawn to the saxophonist by “his really deep harmonic sense,” says Shulman, who plays a series of 30-minute micro solo recitals Sunday afternoon at the SFJAZZ Center. Also: 8 p.m. Saturday, The Sound Room, 2147 Broadway, Oakland, $15-$20, SoundRoom.org.